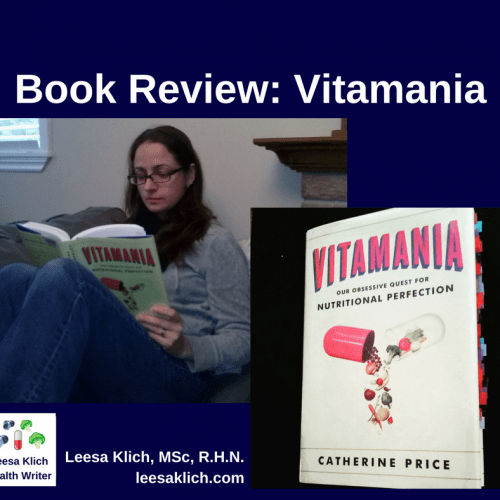 Do we have “Vitamania”, an obsessive quest for nutritional perfection??? Are we obsessed with nutritional shortcuts? Vitamania takes us on a ride, starting a few hundred years ago right up to the present day mass appeal and (lack of US) regulation of most supplements. The word “supplement” has become almost interchangeable with the word “vitamin”, even though supplements can include not just vitamins, but minerals, enzymes, amino acids, antioxidants, and other non-pharmaceutical compounds. Several chapters start with historical accounts of serious and deadly vitamin deficiencies such as scurvy (vitamin C), beriberi (vitamin B1) & pellagra (vitamin B3); and how the quest to cure these diseases eventually led to the slow discovery of vitamins. We have to remember that, before we knew about vitamins, people believed that diseases were caused from air rising from the ground, or laziness, or other things that we now know are not true. Eventually we discovered germs and the “germ theory”. It took some time, and much trial and error to determine that there were critical factors in our food that, when deficient, caused these diseases. And thus vitamins were discovered. Slowly. One. At. A. Time. As a nutritionist, it is fascinating to understand a time where the entire concept of vitamins was foreign; yet we clearly got where we are now, by what we’ve learned along the way. Holistic nutritionists primarily recommend eating more whole foods and fewer processed foods (good advice!). Some of those canned, packaged, and ready-to-eat foods are enriched and fortified with essential nutrients. Enrichment is replacing the micronutrients that were lost from the food during processing, (e.g. replacing niacin in whole grains products). Fortification is adding in new micronutrients that were not there before (e.g. adding vitamin D to milk). I am Canadian; however, can imagine that these statistics are probably quite similar on this side of the 49th parallel. So, I looked up the Canadian stats and found a document outlining whether Canadians meet their nutrient requirements through food. (2) I couldn’t find anything that specified the roles that enrichment and fortification may play. If you know it exists, please let me know in the comments where I can find it. And, if you want to look up the Dietary Reference Values for vitamins and other nutrients, you can check out resource (3) below. Chapter 6 : Nutritional Blindness summarized some of the discussions, and potential benefits of, genetically-engineering beta-carotene into rice, the famous “golden rice” controversy. I personally found this chapter quite interesting, as I knew very little about this initiative to solve a serious nutrient deficiency problem on the other side of the world. Of course, beyond the enrichment and fortification of foods, there are unknown numbers of bio-active compounds in whole foods that contribute to good health. Even today we are discovering more health-promoting molecules in our food. There are many studies that show that regular consumption of multi-vitamins does not consistently help reduce the risk factors for many diseases; nor does it reduce ones’ overall mortality(4); yet increased intakes of fruits and vegetables do! So, we know that there certainly are many things (beyond vitamins) about real, whole foods that help keep us healthy that we don’t know much about! Many processed and pre-packaged foods contribute to our lack of health, despite their added nutrients. on nutrient-poor products (5), companies are casting the illusion of health. This is sometimes referred to as “healthwashing”. I’m not entirely sure how many of these products are purchased based on these front-of-package claims? These claims may convince some people that the processed enriched/fortified food is actually healthy. Perhaps some market research can been done on this? Or, dare I say, it’s already been done and it works, and that’s why these foods continue to be consumed? I, as someone who strategically recommends supplements, was very interested in the second chapter: Plants and Plants. This chapter discusses the current-day situation that there are very few companies and manufacturing plants that actually make the vitamins and supplements. Since vitamin manufacture requires very specialized equipment and materials, opening such a site requires considerable investment. These manufactured vitamins are used for supplements, and also for “enriching” and “fortifying” foods. A “fun fact” I learned in this chapter was that the raw material for most of the world’s vitamin D comes from…(do you know what? )…lanolin from sheep’s wool! What else I found fascinating was that most of the manufacturing of these vitamins is not done in North America. Also, most fresh fruit and many vegetables (both of which are great nutrient-rich whole foods) come from overseas as well! Food security is an important and growing concern(7). There is also the current reality that, not only are many people taking in insufficient amounts of vitamins, but we have an on-going, lifelong requirement for continual ingestion of foods and nutrients! You can’t just eat healthy or take a vitamin temporarily and be done with it. Perhaps the concept of “nutrient” security is also important? Here’s a quote I’d like to address from Chapter 5: From A to Zeitgeist. The discussion begins with Dr. McCollum who, in the 1920s-40s introduced the idea of nutritional chemistry to American homemakers. Some of the things McCollum educated Americans about were the symptoms of extreme deficiency diseases. I mean extreme. As in, things that very few Americans would ever encounter in their life. Yes, many Americans have inadequate intakes of many nutrients which may, over time, contribute to disease. But the examples he used to “fearmonger” were examples of the terrible plight of severe and deadly nutrient deficiencies. Before I go on with my thoughts on this matter, I’d invite you to add your comments at the bottom of this post. Do you think truly successful health gurus are fearmongers? My personal opinion is that there ARE fearmongers among us. There ARE people who demonize certain foods or ingredients as though avoiding them is the only way to perfect health. There ARE people who create entire recipes, meal plans and diets based on the absence of certain foods which are to be feared. There ARE people who try to sell their proprietary solution to a nutrition issue that people don’t really have. And there ARE many health gurus who I couldn’t continue to receive emails from because of their overly sensational “fearmongering” headlines (so I promptly “opted-out” of their emails and “unliked” their fan pages). No, I wouldn’t tell anyone that their teeth will fall out if they don’t eat oranges and bell peppers, or that they will become infertile if they don’t eat wheat germ. That clearly is fearmongering. This does NOT apply to the vast, vast majority of people in North America. Of course, there are rare cases of scurvy(8) and rickets(9) from time to time in Canada, but these are RARE and not to be feared by the general public. Nor should they be used to drum up sales for a guru’s insight to ensure this doesn’t happen to you or your family. It’s not something I want to spread. Let’s keep a “big picture” view of health and foods, and not induce unnecessary fear of foods, supplements or nutrient deficiencies. I’m in favour of empowering people to better health, not inducing fear. Who else is with me on this? In the past century, with the amazing recoveries of people who had been suffering from deficiency diseases, and the relative safety of vitamins (see “Supplement Safety” below), it seems that many people believe that vitamins can cure, or at least treat, many modern day (non-deficiency) diseases, and that they are infinitely safe. I personally find this to be very on-point in a lot of ways. While supplements that are manufactured carefully and labelled honestly can surely alleviate nutrient deficiencies, what else can they do? And who in fact turns to supplements to help them? This is definitely fodder for another entire blog post (blog series, perhaps?) but I did want to say that I’ve done little research into this, yet find it to ring so true per my experience. Of course, not all supplements are safe at high doses, and not all of them have been proven to have all of those wonderful health benefits you might have been told. Many supplements can have side effects, or interact with medications, or mask other conditions. Many can be toxic if overconsumed; vitamin A comes to mind here. You’ve probably heard the saying: “the dose makes the poison”. Vitamins and other supplements are not exempt from this concept. Supplement (and medication) safety is near and dear to my heart. I worked in pharmacovigilance (12) for 12 years, and really enjoyed it. Chapter 7: From Pure Food to Pure Chaos described the history of unsafe adulteration of foods and medicines. Honestly, that section repulsed me. The substances that people used to add to foods and medicines to make them appear to be much heartier, or fresher, or more effective, was horrific. (Maybe with my drug safety background it was more “horrific” to me than others, but I really had trouble with those stories). The big problem that I still see today is that this hasn’t completely ended. You can see in reference (13) Health Canada’s ongoing alerts for adulterated and unsafe health products. In Canada, since supplement labels are regulated, they don’t have nearly as fanciful health claims as they did before the regulations came into effect in 2004. I remember going into health food stores a decade ago and seeing very interesting health claims, along with the American caveat that “these claims have not been evaluated by the FDA”; which, of course, has no jurisdiction over what is being sold to Canadians. That doesn’t happen so much anymore. So what can supplements actually do for us? While some would argue based on multivitamin studies not to take any supplements; know that “multivitamins” are just one type of supplement. One where there are small amounts of several vitamins and minerals in one capsule/tablet. In fact, there is some very good information on specifically targeted supplements. If you want to know what an independent team of scientists has concluded after reviewing the published medical literature, please check out Examine.com at link (14). If you know which supplement you’re interested in, then this information is available for free on their website. If you wanted, however, to search for supplements that may help you reach your “health goal”, then you might consider purchasing their Supplement Goals Reference. If you are a health professional, this is the supplement guide that I use and reference daily. Yes, daily! If you’re interested in where nutrition research is headed in the future, and a list of some things we really don’t know yet about nutrition, as well as some of the difficulties in studying these, this chapter is for you! The difficulty in researching the complex synergistic effects of whole foods, compared with what we already know about certain isolated substances like vitamins and minerals. Basically, why supplements are NOT the answer to a poor diet. What we really don’t know about the health effects of long-term moderate nutrient insufficiencies. Shout out to Bruce Ames(16) for his comments here (I learned about his Ames Test in 2nd year toxicology). What we are starting to learn about nutritional genomics and trans-generational effects of poor diets (epigenetics). For a fun 9 min overview of epigenetics, check out reference (17). Do we, as a society, accept the idea that anything that contains vitamins must be good? Should more of us be asking why our food supply requires so much reverse-engineering to begin with? Do we revere thirteen nutrients (e.g. vitamins) above all others (known and not-yet-known)? If you like what I’ve said about this book, consider giving it a read. Note, the nice bright yellow image of the book cover as well as the link right below are affiliate links where I’d earn a small commission if you decide to buy the book (or anything from Amazon), without any extra cost to you. If you’d rather buy it without sending a small commission my way, feel free to use this link here.